iOS Developer Zone | Notes, hints, tips and the occasional rant on iPhone and iPad app development. The Model I/O framework was introduced at WWDC 2015, however there is remarkably little sample code out there. Over the past few days I have been trying to write reliable code to import an .OBJ file and apply textures to it. In this article, in the hope that it will save some others some pain, I’ll explain how I got it to work. To get started download the starter project from GitHub. This project contains a single view app , some graphical resources and a 3D model. 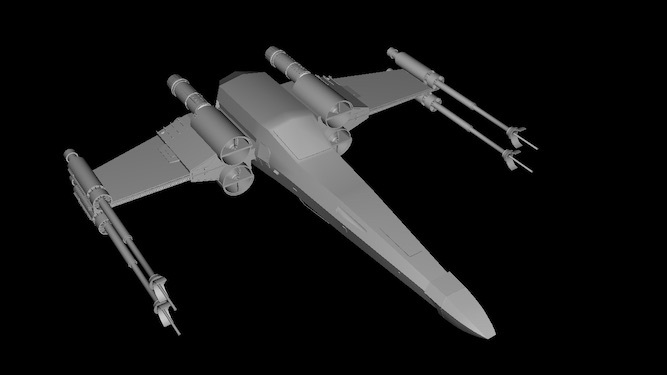 The model comes from the Free Star Wars Model Pack from Video Copilot. Let’s get started by loading the OBJ file. An OBJ file can be loaded directly into an MDLAsset from a URL. This code determines a URL for the OBJ model file in the app’s bundle and loads in into a MDLAsset. It then extracts the mesh from the asset. This will be used in the next section to create a SceneKit SCNNode to wrap the model. To check that the model has loaded correctly it would be nice to display it on the screen. This is a two step process: (1) create a SceneKit scene containing the model and (2) display the scene in a view. The above code creates an empty SCNScene, an SCNNode containing the model and then adds the model node to the scene. The sceneView variable here is a computed property in the starter project that refers to an SCNView in the storyboard. The autoenablesDefaultLighting is a convenient option for getting some basic lighting going with minimal code. The allowsCameraControl allows you to rotate, pan and zoom the model via touch gestures. Once these options are set all the remains is to set the scene property to the scene from the previous code section and set the background to black (the default material is light grey so it shows up better against black). At this point you can run your project and if all is well you should see something like this (after a little rotating and zooming). 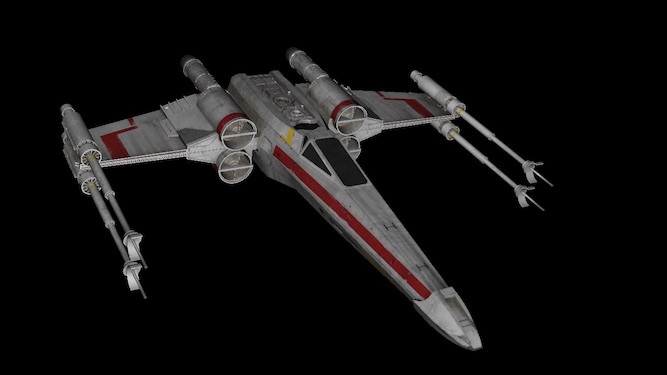 The space fighter model with no textures applied. In Model I/O to texture a model you create an MDLMaterial and add properties to it to describe the material. This creates a material with the a default MDLScatteringFunction object. For each of our textures we need to determine the URL for the texture image, create a MDLMaterialProperty and then add this to the material. Repeating the same few lines of code for each texture is tedious, so instead I created an extension on MTLProperty to simplify this. You can compile and run your project. You should now see a much more impressive model. Model I/O does allow you load models with relative few lines of code, but some of the steps are unintuitive, for example, it took me quite some time to figure how to attach the textures to the model. There also seem to be some bugs and poorly documented areas. Some additional sample code from Apple would do a lot to clear up some of these mysteries. I hope the code I’ve presented here will help you avoid some of the pitfalls I made. The completed code can be found in the GettingStartedWithModelIO repository on GitHub. Ads on this site help keep the servers running. Please take a moment to peruse our sponsors and perhaps visit one. This article explains how to use CoreLocation and MapKit to display a location and speed on a map. To get started download the template project from Project Template. This is a simple, single view project with an MKMapView occupying the entire screen, overlaid with a UILabel to display the speed. These are linked to the mapView and speedLabel IBOutlets respectively. May I Know Where I Am? // Please sir, may I know where I am? Tell Me Where I Am! There was no activityType matching train and I had a power outlet at my seat, so I greedily configured my the best accuracy. To minimize the drain on the user’s battery you should try to choose the minimum desiredAccuracy that is sufficient for your needs. Add the following code to configure the location manager to report at the best accuracy. The location manager in the previous section tells us where we are in terms of longitude, latitude and speed, but to really visualize it we need a map. And finally… We come to the main part of the program. This function updates the label with the speed. Called when location changes, updates speed in speed label. The completed code for the tutorial can be found in the Shinkansen GitHub repository.